Description: In the stunning conclusion to the Secrets of the Eternal Rose trilogy, there is nothing more dangerous that a secret closely kept... Cass and Luca are fugitives, on the run from the law and the deadly Order of the Eternal Rose. As they separate to pursue the only evidence that could save them, their worlds-and their romance-are torn apart by spiteful friends and murderous enemies. When Cass finds herself ensnared in the Order's twisted plot, Falco emerges once again as her only hope for freedom. But it turns out Luca has a shocking scheme of his own. From ancient mercenaries to sly magicians, from clever courtesans to vengeful killers, no one can be trusted. In the breathtaking conclusion to the Secrets of the Eternal Rose trilogy, Cass must confront the Order and once and for all decide her destiny. Who will fly beside her when she finally finds her wings? This historical romantic thriller is perfect for fans of Philippa Gregory's The Other Boleyn Girl, Anna Godberson's The Luxe, and Libba Bray's A Great and Terrible Beauty and The Diviners. 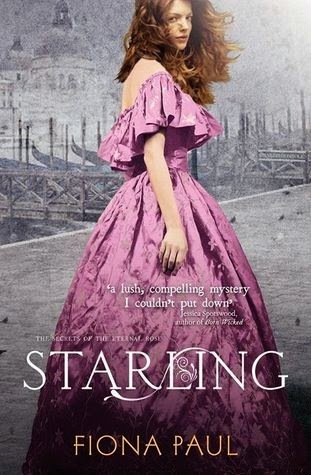 Starling by Fiona Paul brings to a close Cassandra’s story and what a story it is filled with murder, secret societies, science experiments, courtesans, masquerades, romantic trysts and blood. Lets not forget the blood. Starling instantly pulls you back into its lush world of hidden secrets buried in the darkness of Venice. It’s truly a satisfying conclusion to a wonderful series as Cass’s story comes to a full circle and she figures out who she is and what she wants. We also get a conclusion to the love triangle that has forever been brewing. Starling has a lot more action than the previous instalments. Picking up from where Belladonna left off, Cass and Luca have managed to escape from the Doge’s prisons but now they must find away to find a way to end the Order of the Eternal Rose. In her exploits Cass meets some exquisite new ladies that will no doubt enchant. We also get to see some favourite characters return such as a certain magicigian, Felicianna and the mysterious Falco. Overall Starling’s spotlight is on Cass as she finds away to deal with the Order and figures out what she wants on a more personal note. Cass always seems to find herself in precarious situations only to escape and land in more danger. Out of the oven and into the frying pan needs to be Cass new motto because she is truly put through a lot. The setting of Venice has always added so much colour to the story, always enhancing the mysterious and vivid tale being told. Paul beautifully brings Venice to life and with it all of its secrets. When we first meet Cass she’s a girl who is running from her future and trying to escape the chains that confine her. She doesn’t know who she is and what she wants. By the time Starling comes to a close we see a different Cass than who we first meet. What I love about Paul’s writing is the wonderful character development. It’s brilliant to watch Cass develop slowly from an unsure young lady into a woman who knows what she is capable off. She is tested time and time again and she emerges as a strong, vibrant and caring girl. She grows leaps and bounds throughout the entire trilogy as she escapes from murderers, saves those she loves and protests those closest to her. Cass finally comes to realise what she wants. Luca and Flaco also have great character arcs. They are very different people at the end of the book. Luca is no longer the studious quiet boy and Falco is not just the passionate artist. I love how much all the characters shine in this book, especially all the secondary characters such as Luca, Falco and Felicianna. There each have their own stories that are beautifully woven in with Cass’s. Paul has done a great job in balancing all of the romance in this book. The love triangle is one of the best ones I have seen in YA fiction. Luca and Falco are both different in their own way and push Cass in different directions but I greatly appreciate all of the thought and emotion that went into picking the right guy, instead of having Cass end up with the hottest. In the end Cass does make a choice and it’s the right choice for her. Starling is a satisfying conclusion to a great trilogy. If you want a series set in a Venice where murder abounds than you should check this trilogy out. Plus there is heaps of romance to be found. I haven't heard of this trilogy, I will have to check it out!